Full Sail Brewing Co. of Hood River, Oregon was one of Oregon’s first craft brewers and had been employee owned for years. Like many craft brewers who have been around that length of time, Full Sail has had many ups and downs. Just recently, the 78 employee-owners voted to cash out and sell to Encore Consumer Capital. Full Sail’s annual volume is impressive at 115,000 bbls. and the Full Sail beers are highly awarded and respected. While none of the terms and conditions have been made public, these 78 employees have all agreed to remain at the brewery. In recent years, private equity firms have discovered the craft industry and aggressively pursued opportunities. One of the most interesting announcements came recently with the formation of Enjoy Beer by Rich Doyle and the investment firm of FFL. As one of its founding partners, Enjoy Beer has signed 160,000 bbl. brewer, Abita and is actively looking to sign up to four additional partners. When they are ready, their plan is to take Enjoy Beer public. As we know, ABI has been active in buying successful crafts purchasing breweries including Goose Island, and recently 10 Barrel Brewing and Elysian Fields Brewing, all of which were growing and well regarded brands with loyal consumers. Both 10 Barrel and Elysian Fields are located in the Pacific Northwest. When Schlitz decided to sell out in the early 1980s, it was the result of producing liquid that was damaged. In spite of their efforts to again brew good beer, the damage had been done. Coors Brewing Co. had an interest in acquiring Schlitz because they wanted to begin the sales of Schlitz Malt Liquor and Old Milwaukee as they, Coors, had no brands in those segments and both brands were category leaders. Unfortunately for Schlitz, and their wholesalers, the government would have challenged this under anti-trust laws. Stroh Brewing Co., however, which was much smaller than Coors, was able to move forward and purchase Schlitz with government approval. Stroh, while not in the same position as Schlitz, was a small regional brewer who was struggling to maintain market share. Many of us, who were Schlitz wholesalers at the time, privately believed that putting two sick companies together would not create one healthy company. Ten years later, that proved to be true. Heileman Brewing Co., made up of a number of successful regional craft beers including; Rainer, Henrys, Old Style, Lone Star, Mickey’s, Iron City, Drewrys and others sold to an Australian named Alan Bond. Heavy debt and declining sales forced Heileman into bankruptcy and eventually they, too, sold. Since 2008, the beer industry has seen the rapid rise of craft beers, while the overall industry continues to shrink, meaning that ABI and MC have lost millions in sales. The world financial experts continue to discuss the possibility of ABI buying SABMiller. Some think it will eventually happen, while others seem to think that there are too many complicated and conflicted issues which will preclude this purchase from happening. From a distance, based on sales, one might initially see another Stroh/Schlitz model of brands that are struggling. What if ABI and SABMiller come to the conclusion that the craft segment will grow to a 50% share of the US market? Imports, led by the Mexican beers could grow to a 20% share. That would leave 30% for ABI and MC. The question then is: how much money will these two giant companies throw at large craft established breweries? With PE firms, along with ABI and MC as buyers, it is no wonder that Full Sail and others have chosen to cash out. The difference between genius and stupidity is simple: genius has it limits. The trailer for the new upcoming Star Wars movie has just been released and within the first 24 hours there have been over 30 million views on YouTube. No doubt it will win multiple movie records when it opens in December. The excitement is building and everyone is talking about this upcoming super movie. This past week in Portland, Oregon, the Craft Brewers Conference was held. The attendance was in excess of 11,000 people at the conference center in downtown Portland. The exhibition floor was packed from nine to five every day as brewers, soon to be brewers, and wannabe brewers visited all sorts of companies who cater to the industry. As you can imagine there were many brewing equipment manufacturers, packaging, cooperage, bottlers, canning equipment, and hop sellers which came from all over the world. There was even one from Mongolia. In addition, there was a large number of tap handle companies, p-o-s, glassware, and neon suppliers. The list goes on and on as the size of the display area was massive. The rapid and dramatic growth of the craft segment has created the need for beer industry education and training. In addition to Portland States classes in the Business of Craft Brewing, schools such as Oregon State, U. of Portland, San Diego State, Fresno State, Colorado State, and many others have started schools addressing all areas of the beer/wine/spirits industry. In many cases, there are waiting lists of students eager to get into the upcoming semester. The number of up-coming or wannabe brewers at the convention was amazing. Some booths featured accountants who specialize in craft cost accounting, lawyers who have developed specialized practices in craft labor laws, compliance, and some in contract negotiations specifically for craft brewers. In addition, there were marketing firms who target branding opportunities and experts in social media. In essence, it was a one-stop-shop for anyone interested in learning about crafts. The conference schedule included seminars on various industry concerns and topics. Panel discussions took place hourly on every subject from building a brewery to retailer insights, all of which were well attended. After five every night the attendees converged on the local breweries in Portland, enjoying all the great beer and the wonderful sunny weather. The only issue was finding a cab, as Portland does not allow uber in parts of the city. The executives and shareholders of those mega breweries in Antwerp, London, New York, Chicago and Denver, while enjoying the majority of market share, must be feeling the heat from Portland. The Craft Brewers Conference excitement was similar to the Star Wars, The Force Awakens trailer for the Christmas movie. In fact, I have never seen such craziness in all my years in the industry. The craft segment is on fire and will continue to be so. To the craft brewers: May the force be with you! When Miller introduced Lite in the early 1970s, no one in the industry had any idea how big the light segment would end up being. Miller Lite took off, followed by Budweiser Light, Coors Light, and Schlitz Light, followed by the regionals with their own version of light beer. A few years later, the light segment surpassed domestic premiums, becoming the largest selling segment and remaining so today. Lights have survived a stream of new flavors and segments introduced over the decades, including, but not limited to, Dry beers, Ice beers and even LA beers. Almost all these new products, including light beer, came from the large breweries who were working to increase their market share from their competition. To some degree, why rock the boat? 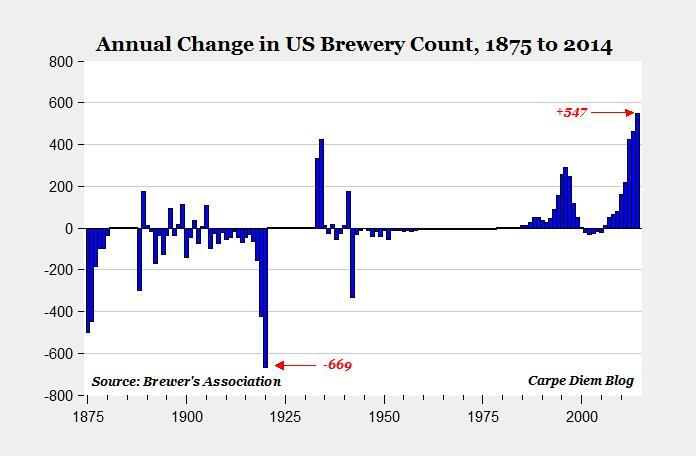 The chart above shows the annual brewery count since the late 1800s. 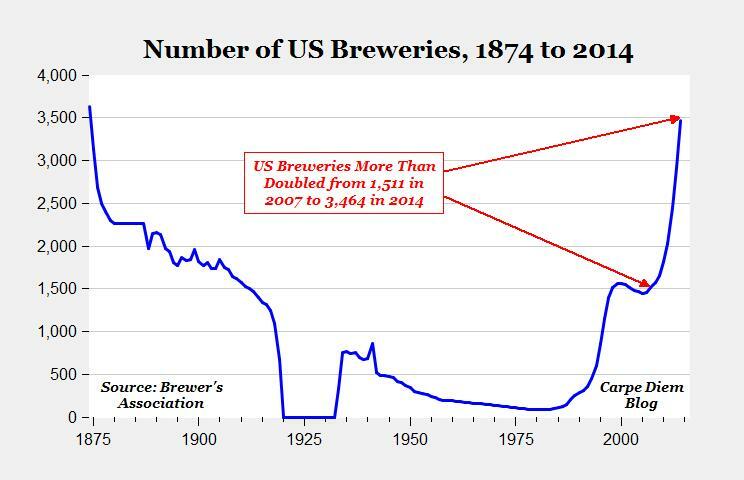 From the late 1940s to the late 1980s there was little increase in brewery count; however, the growth rate for new breweries since the 1980s has been incredible, with almost 3,500 breweries and more coming. In fact, many colleges are offering brewing classes as part of their curriculum. Some schools, including Portland State University, are offering programs that cover not only brewing, but other aspects of the industry, as well. PSU’s class on sales and distribution has more than 33 students registered. Many of these students come from as far away as Germany, Canada and Puerto Rico, and were already in the industry working at breweries, wineries, ciders, and even hop farms. Almost all either owned, or were planning on owning, their own operations. Today is the beginning of this year’s BA convention in Portland. Attendance will be around 11,000 people and runs until Friday. As in Portland State’s craft beer program, the excitement for the BA convention grows every year as more and more people see crafts as the place to be in beer. To some degree, the craft industry is not unlike the light beer industry when it began growing by double digits. The craft industry is now around 11% of the total beer industry. The question remains, just how big will crafts get? There are some who believe that obtaining a 20% share by 2020 is a realistic goal, and based on recent trends, 20% seems to be very achievable. Forecasting success of any brand, much less the size of any one segment is, at best, difficult. But what we do know is this: two companies control over 50% of the beer industry with light beers, a segment that is in a slow decline, and there are over 3,400 breweries that produce a product that represent only 11% of the beer market, and that segment is on fire with thousands more operations scheduled to open. These small operations do not have to put up with the corporate bureaucracy and other obstacles with which the large mega breweries deal. These upcoming craft brewers know what their consumers want and are giving them those craft beers. Just how big will crafts be? It is simple. As with these brewers, the empires of the future are the empires of the minds. Forget ‘branding’ and ‘positioning.’ Once you understand customer behavior, everything else falls into place. It goes without saying that arguably two of the largest global sporting events are the World Cup and the Olympics. Annually, however, the largest sporting event has to be the Super Bowl. 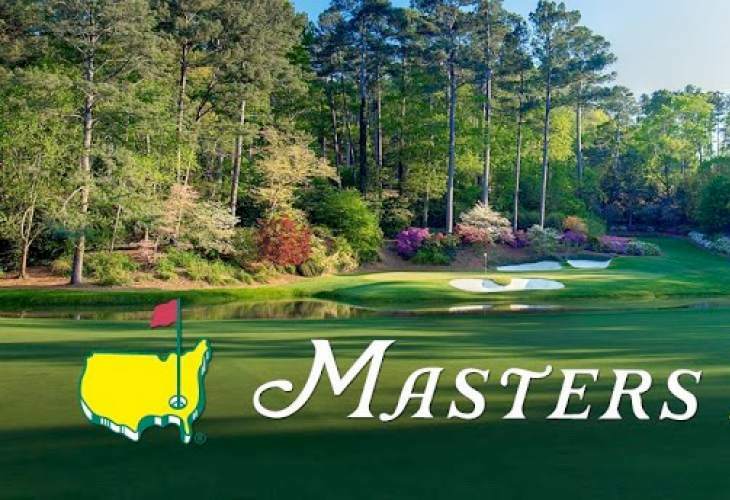 Right behind the Super Bowl, the Masters Golf Tournament could easily be the second largest annual event. This is Masters Week. The tournament, which has become the most exciting one in golf, is perhaps most appreciated by those who are fortunate enough to score the tickets as they are very affordable. Beer, food, drinks, and merchandise are all reasonably priced, too. You will not see $9.00 beer at the Masters. Also, the tournament has no commercialism. No billboards, no neon signs, no signs at all, not even logos on the cups. The Masters serves three beers: a regular, a light and an import. The consumer does not know the brand; there are no names on the tap handles or signage at the tournament. If you want a light beer, you say light! If you want an import beer, you say import. People do not go to The Masters for a certain beer, and for the most part, do not care what they drink. Than the question to ask is: just how important is branding? A recent edition of Ad Week highlighted a paper written by a professor at the University of Texas who stated that while advertising activity for alcohol has increased by over 400% since 1971, per capital consumption has not increased. This is not surprising for most of us who have been in the industry for a while. Year in and year out the industry has either been flat or declining. Competition for share of stomach is tremendous, not counting outside pressures including the legislative type. It would be hard, if not impossible, to imagine any brewer advertising in an attempt to increase overall consumption. Ever heard of any brewery executive say they are marketing to increase consumption? The year 1971, when Philip Morris purchased the Miller Brewing Company, marked the beginning of the employment of techniques once used to advertise cigarettes, being implemented to advertise beer. This strategy woke up Budweiser and the rest is history. The 400% increase in ad spending is certainly tied to this one event. How effective these ads were in branding and positioning should be the topic of another study, the results of which might show that it was more a concept of drowning the consumer in media than effective advertising. Either way, consumption levels were not discussed. Perhaps the ad industry should look at The Masters as a perfect example of forgetting about branding and positioning, and allowing everything else to fall into place once consumer behavior is understood.